While two class champions had already been crowned, it took until the final Labour Day race weekend of the 2012 Canadian Touring Car Championship season to decide the Touring class champion. 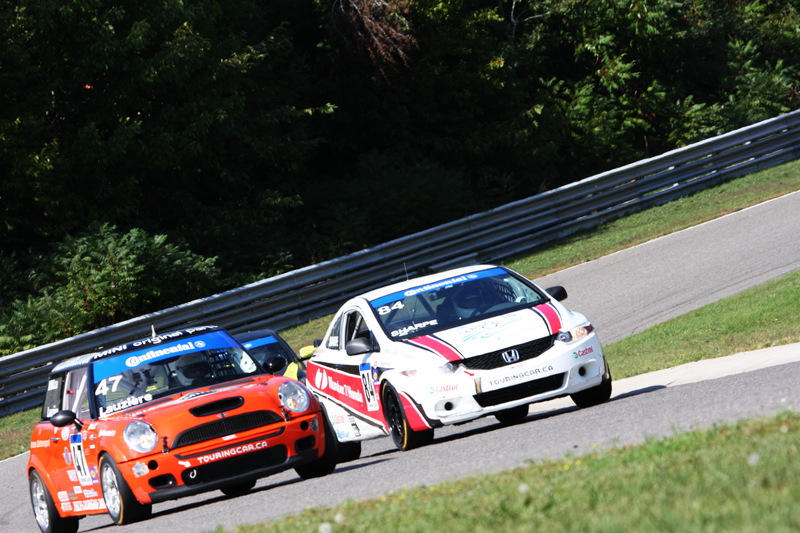 When the checkered flag flew on Sunday, Sept. 2, it was Damon Sharpe in a Honda Civic Si who won the final two races of the season at Calabogie Motorsports Park near Ottawa and took the Touring class championship, defeating his closest rival Michel Sallenbach of Roxton Pond, Que., in a Mini Cooper. For Sharpe, of Tottenham, Ont., to take two Touring class wins in the final event of the season, as well as the class win in round 14 in Montreal, was vindication for a tough season. Sharpe’s luck began to turn in Montreal and continued when he hit Calabogie. He started from the pole position and took the lead early. As Sallenbach tried to pass him, he went on to the grass, damaging his suspension and ending his race. “I am too competitive and I know I blew it all by myself,” Sallenbach said after the race. All Sharpe then had to do was finish the next race and the class championship would be his. But he wasn’t ready to relax just yet. He again started from the pole for the final race but then “dropped back to fourth and started to make some mistakes. I got on to the grass and got all crossed up and had to tell myself, okay, get the mistakes out of the way.” His crew told him he could take it easy and run a conservative race, but “I guess I’m not wired that way.” Sharpe went on to take the Touring class win in his first full season in the CTCC. In Super Class, Sasha Anis of Mississauga, Ont., drove his Hyundai Genesis coupe to top spot with 1,765 points and Nick Wittmer of Vaudreuil-Dorion, Que,. was crowned B-Spec class champion with 1,404 points in his Honda Fit. Sharpe ended his season with 1,578 points. The Canadian Touring Car Championship season began in May during the Victoria Day weekend at the Canadian Tire Motorsport Park track near Bowmanville, Ont. Drivers competed in two races in each of the eight race weekends, and the CTCC also made stops at Mont-Tremblant; as support races for the Formula One event and the NASCAR Nationwide race at Circuit-Gilles Villeneuve in Montreal before ending the season at Calabogie. Racers are divided into three classes: the entry-level B-Spec Class features compact cars, such as the Fit and Mazda2, with stock engines; the Touring class features cars such as the Mini Cooper and Honda Civic Si with minimal modifications; while Super Class machines such as the BMW 330i and Acura RSX have powerful and heavily modified engines and advanced aerodynamics. All three classes compete at the same time on each track. Anis dominated the season in Super class, with 15 podiums in 16 races. After a dismal season in 2011, he was primed for success in 2012. Anis joked that his crew chief, Andrew Stittle, might be a good luck charm for both he and Sharpe. In addition to his crew chief role, Stittle took on the job of driving Sharpe’s transporter. Then the Tottenham driver’s luck took a turn for the better and he started to win races. Bondar was pleased with the performance of both Anis and Sharpe. “Sasha kind of drove away from all the other guys. There might be some jealousy but the other drivers respect him. He never does anything dumb on the track. He’s a great champion. For Bondar, highlights of the 2012 CTCC season include the series’ first night race at Trois-Rivieres, Que., in August and taking part in the Formula One weekend in Montreal in June. “We had some great track times for the F1 event – nothing at 8 a.m. or 6 p.m. – all of it was in front of the crowds,” he said. That weekend was capped off with a spectacular crash by Andre Rapone, which saw his B-Spec Mini Cooper launch itself off a curb, across the track and into a wall. Rapone was unhurt, but the in-car video of his crash has so far notched up more than 5,000 views on YouTube. The series is also enjoying some more conventional video exposure through P1, a reality-based TV show on the CTCC and its drivers that airs on Sportsnet and will run until the end of 2012, and possibly into next season.